Why is my battery icon not visible in the taskbar? To get a little more clarification whether this tutorial applies to you. When you go to settings and search for Turn system icons on or off and you click on Turn on Power. You can not make changes because it’s grayed out, and there is no Battery icon in your taskbar. Battery icon missing in Windows 10. I can not tell you exactly why, but I do have the solution for you. How do I get my battery icon back in the taskbar? In short: We’re going to the device manager and we’ll disable the AC Adapter and ACPI Compliant Control Method Battery driver. After re-enabling the drivers the icon should be visible again. 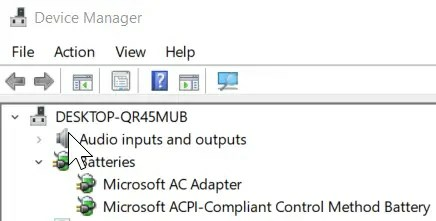 Go to Start and search for Device Manager. Open the Device Manager and search for Batteries. Right click Microsoft AC Adapter and disable the device. Do the same for Microsoft ACPI-Compliant Control Method Battery. Wait 20 seconds and then re-enable them again. The icon should be visible in the taskbar and you should be able to make adjustments to the Power options again. I am no longer in the position at work where I encounter many error messages that users experience. In order to still be able to use my blog, I now look at forums such as Answers, Techcommunity and other forums to update my blog. I use the error messages that people get to make new posts, if the answer is already complete I do not do anything with it. If I think the answer is not completely correct, or unclear, I will make a tutorial. I then link to the forum post. Next Next post: FIX: File not found. Check the file name and try again. When you’re trying to save a file.